~❧ Robert Burns Supper, Sunday, January 27th Celebrate Scotland's beloved bard. ~❧ Valentine's Day, Thursday, February 14th Love is in the air! ~❧ Lamplighter Brewing Co. Dinner & Tasting, Sunday, March 3rd Brewery tour, tasting, & seated dinner. ~❧ Cooking Class at Boston Public Market, Monday, March 11th Hands-on whole grains cooking class. ~❧ Vegan Menu, Wednesday, March 20th Five-course entirely vegan dinner menu. ~❧ Wines of Argentina Dinner, Wednesday, April 3rd Special menu celebrating Malbec & other varietals from the Uco Valley. ~❧ Bread Class, Tuesday, April 16th Just in time for your Easter table! Learn bread making from Chef Bond. 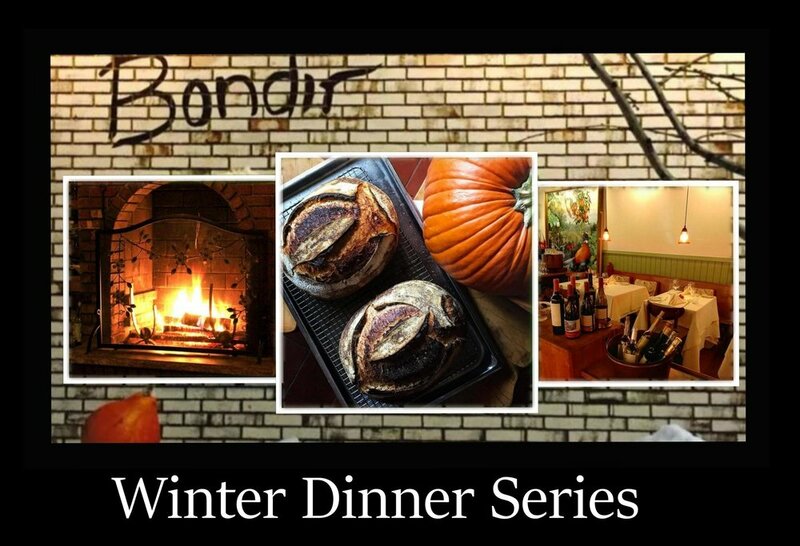 Please visit The Winter Dinner Series page for details! Join us to welcome the New Year! Join us at Bondir the evening of December 31st when we'll be offering a special five-course menu, including vegetarian choices, plus of course a toast! Chef Bond is putting the finishing touches on the celebratory menu, featuring beautiful New Hampshire brook trout, Mangalitsa Pork from Codman Farm, root cellar vegetables from Sweet Autumn and Hutchins Farms, and an amazing Vacherin Mont d'Or from Formaggio Kitchen. We look forward to seeing you, and raising a glass together! Cheers! It is a genuine honor and real thrill to be included in Boston Magazine’s 2018 list of Top 50 Restaurants in Boston. We are grateful to be counted alongside some of the city’s most talented in the industry. Summer 2018 - Please join us this summer for a series of special events that celebrate summer. Six-Course Vegan Dinner Thursday, June 14th, With produce from Sweet Autumn Farm. Strawberry Moon & Solstice Thursday, June 28th, The first harvest of summer. Bastille Day Sunday, July 15th, With sparkling wine pairings. Frozen Menu Wednesday, August 8th, A menu for the heat of summer. JT's Herbs & Produce Pop-Up Sunday, August 19th, With Chef & Farmer Jade Elan Taylor. Sturgeon Moon Sunday, August 26th, Caviar and the bounty from the sea. Hutchins Farm Dinner Sunday, September 23rd, Celebrate the end of the harvest. Join us for a fun and festive night as we ring in the New Year by celebrating the very best ingredients of the season! We'll be offering a five-course menu, including vegetarian choices, plus of course a toast! Chef Bond is putting the finishing touches on the celebratory menu, featuring Mangalitsa Pork from Pete & Jen's Backyard Birds, Medlars and Butterkin Squash from Sweet Autumn and Hutchins Farms, an amazing Vacherin Mont d'Or from Formaggio Kitchen, and a Purple Corn and Huitlacoche Chocolate Dessert. Bondir's 7th Birthday! Special Celebration Dinner. To celebrate our seven years and all the friendships we’ve made, we're lighting the fireplace and spit-roasting a couple of dry-aged Prime Ribs of New England Beef. We hope you will join us on Sunday, November 12 for a Cocktail Hour and Three Course Menu. Plus, get a first peek at our new collection of rare and old Cognacs, Armagnacs, and Scotch, for sipping and considering by the fire. JT's Herbs & Produce @ Bondir: A two-night pop-up! Bondir is excited to welcome back one of our first Sous Chefs, Jade E. Taylor. A Chef and a Farmer, Alabama native Jade will prepare a special five-course menu celebrating the harvest season and the bounty of her own farm, JT’s Herbs & Produce. Expect a menu of unique heirloom vegetables and local meats influenced by Jade’s Southern upbringing and the diverse melting pot of North Shore flavors. Jade spent two years cooking at Bondir before starting JT’s Herbs & Produce. 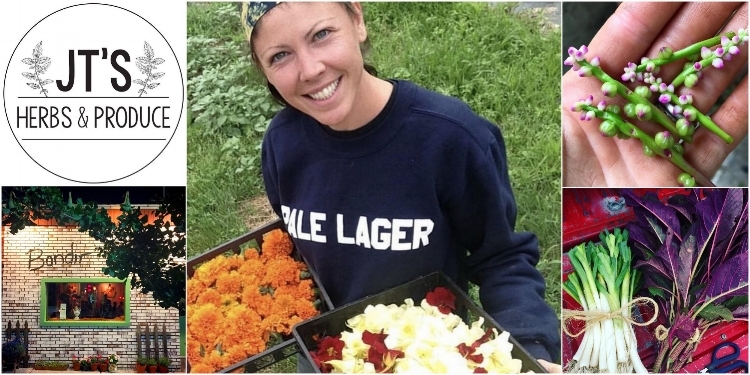 With training from the Tufts New Entry Sustainable Farming Project, Jade based her business on land at Arrowhead Family Farm in Newburyport, MA. Arrowhead Family Farm was founded in 1683 and is now in its 12th generation. Jade continues working as a chef while she supplies herbs and produce to some of the best restaurants in the Boston area, including of course Bondir. "It’s not just Lamplighter beer dinners that have come from the brewery’s proximity to the award-winning Bondir restaurant. Now the co-located café, Longfellows, is reaping the benefits of being neighbors with chef Jason Bond. 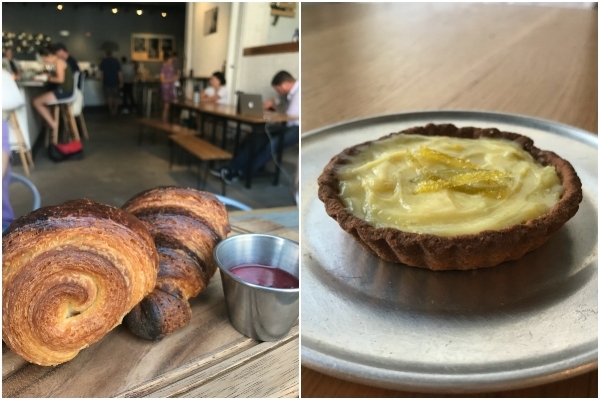 Bondir-made croissants and other baked goods are now available daily on the café menu." Neighbors unite! 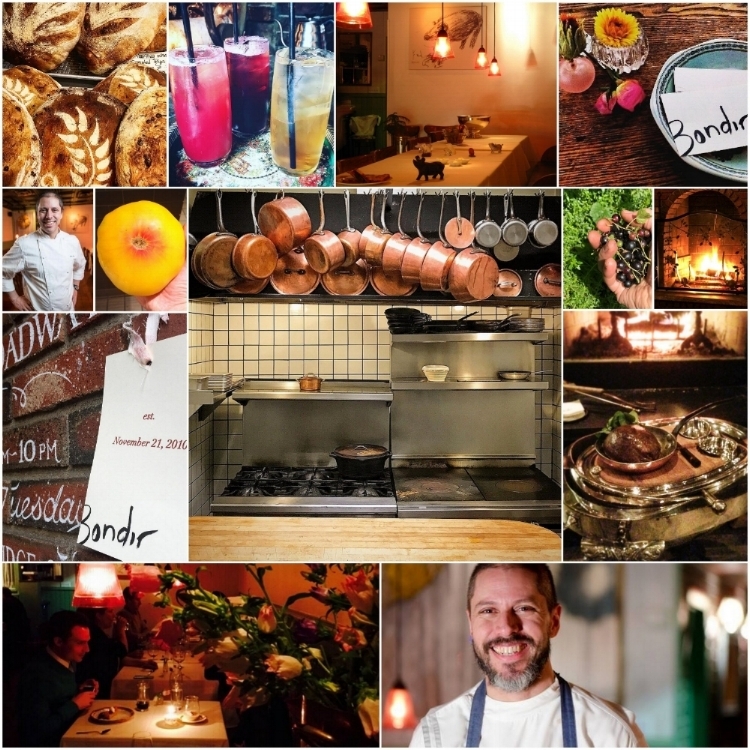 Bondir and Lamplighter are pairing up for a multi-course (and multi building!) beer and food extravaganza. Start the evening with appetizers and beer in the Lamplighter taproom, and learn about the brewing process with a guided tour through the brewery. After whetting your appetite, journey across the street to Bondir for a seasonal 5-course meal paired with Lamplighter brews. Learn about the food from Chef Jason Bond, and ask questions about the beers from Lamplighter Head Brewer Tyler Fitzpatrick. Welcome and Tour with Snacks! "All our activities at Hutchins Farm are informed by a profound respect for the land, the people who work the land, and our community of customers. Our commitment to sustainability is threefold—a desire to sustain ourselves and those who work with us with a vibrant, viable economic enterprise; to sustain the land we cultivate through responsible practices and a sense of stewardship; to sustain our customers by growing and selling only the freshest, most flavorful, most healthful produce available. We hope and trust that our commitment will serve, in some way, to help sustain the larger communities to which we belong." To learn more about Hutchins Farm, please visit the About and History pages of their website. Le Quatorze Juillet, Bastille Day! Chef Jason Bond is pleased to offer a special Bastille Day Dinner on Friday, July 14th, 2017 featuring a five course menu and Champagne pairings. Reservations Are available from 5pm to 10pm. Join us this Sunday to celebrate Mom, and the arrival of some beautiful spring produce! We will be open special hours and offering 2 seasonally-inspired menus. *Menus subject to change based on availability of the freshest ingredients. Reservations are available between 12PM and 4PM. Please call 617-661-0009 or reserve your table online. Please Join Us For A Warm Celebratory Evening on Saturday, December 31st as we ring in the new year. We Will Be Offering A Five-Course Prix Fixe Menu That Will Include A Champagne Toast With Dessert! A Suggested Five-Course Wine Pairing Will Also Be Available. Reservations Available between 5 pM and 10 PM. This Tuesday . . enjoy food, drinks, silent auction, and raffle prizes all while supporting a really great cause. The Boys and Girls Club of Dorchester provides children a safe place to learn and grow, relationships with caring adult professionals, and life-enhancing programs and character development experiences. Bondir Cambridge Chef de Cuisine Pierce Kelley joins a team of great chefs in support of a great cause!!! Please consider buying a ticket to attend this fantastic event hosted by Steel & Rye in Milton, MA. Thank you! Visit the Eventbrite page for details, and tickets. Join us for a special Market Lunch on Mother's Day. We are featuring two separate 3-course menus - one completely vegetarian. Both menus will be created "day-of" from the Fresh produce at the farmer's market that morning, as well as the week's best offerings from our local farms, as usual. Join us for an Easter-inspired lunch menu! Five Course Seasonally-Inspired New Year's Eve Menu, $75 per Person. For Reservations please call 617-661-0009 or reserve online via OpenTable. A special selection of champagnes chosen to compliment the menu will be on offer for this celebratory evening. Chef de Cuisine Brendan Joy has invited his old friend, Chef Leo Asaro, to join him for one night as a guest chef in the Bondir Cambridge kitchen. Originally from St. Louis, with deep Italian roots, Chef Leo Asaro spent family summers in Cape Cod, digging clams with his brother and learning how to cook the local larder found in the northeast. Upon his graduation from Johnson & Wales University in Providence, RI, Chef Asaro served an externship under Daniel Boulud in New York. He has worked for Chef/Restaurateur Michael Schlow for more than 10 years: at Radius Restaurant where he worked alongside Chef Brendan Joy, as Executive Chef of Via Matta; and most recently, as Executive Chef at Tico Restaurant. This dinner reunites Asaro and Joy behind the pass for the first time since their days as line cooks at Radius Restaurant. Bondir Chef-Owner Jason Bond receives very first Culinary Stewardship Award from WGBH. Bondir Chef-Owner Jason Bond was "...really honored to receive the first Culinary Stewardship Award from WGBH. Thanks for a fabulous day among great people and great chefs/wine peeps," via Chef Bond on Instagram. From the WGBH Food and Wine Festival: "The award celebrates a chef who educates or informs on food topics or cooking techniques, inspires others to try new things, and contributes to the improvement of food quality by investing in a sustainable food supply chain." Announcing! Our New Five Course Menu Begins September 9th. Please join in celebration of Bondir Gardens first harvest! For 2 weeks in August we will feature a special four course, prix fixe menu composed of fresh, seasonal ingredients locally-grown at the garden. Bondir Gardens is farmed by Veronica Chudik, as part of Tufts University’s New Entry Sustainable Farming Project. The menu will be accompanied by an optional drink pairing featuring wine and homemade sodas accentuated with foraged flowers, roots and aromatics. Join Chef Jason Bond for an informative afternoon in the Bondir dining room as he leads a Mangalitsa pig butchering demonstration, with dinner to follow, for an intimate group of ten guests. Chef Bond will show participants his butchering techniques on this heritage breed of pig, known as “the Kobe Beef of Pork.” (Chef Bond introduced the Mangalitsa pig to New England in 2009.) Participants will experience a complete hands-on demonstration as techniques from traditional to modern are demonstrated, including sous-vide, curing, dry-aging, and the use of “difficult” parts of the animal. The afternoon will include discussions on strategies for managing and pacing of usage of animal from delivery of animal through its final serving. The demonstration will conclude at 6:00 p.m. and a Mangalitsa menu from the day’s work will be served. Please join us and our good friends Didi Emmons and Eva Sommaripa for a special dinner to celebrate the release of Didi’s new book WILD FLAVORS, One Chef’s Transformative Year Cooking From Eva’s Garden. Didi and her inspiration – celebrated organic farmer Eva Sommaripa, will share stories and read from the book. Chef Jason Bond will offer a menu based on the ingredients and recipes from Wild Flavors.